Lilly Waters is loving life as the new assistant manager at the Smugglers’ Tavern in the small town of Danger Cove. So the last thing she wants or expects is an impromptu family reunion with the wannabe-rock star dad and his number-one-fan (her mother) who were noticeably absent from her childhood. Not only does Lilly have her hands full dealing with her mom and dad who act more like teenagers than parents, but she also finds herself in hot water when the son of a Chicago mob boss is murdered on tavern property. Now Lilly's mom is the number one suspect, and Lilly isn't sure where her loyalties lie. The search for answers leads Lilly down a dangerous path where she uncovers more suspects than she can say Thanksgiving grace over - including a tattooed troublemaker, a gambler who turned against the mob, and even her own father! 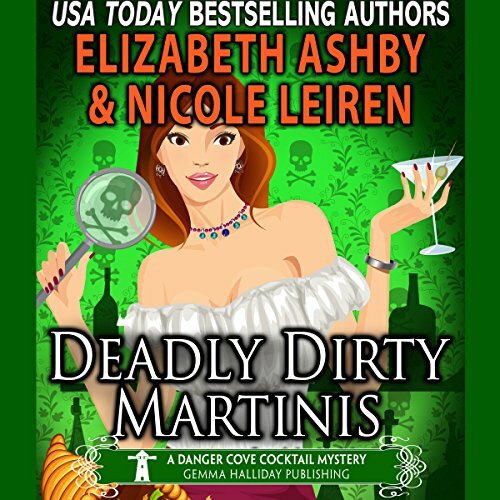 All their motivations prove dirtier than her signature martinis, and if Lilly doesn't get to the truth soon, not only will dinner be ruined, but the killer may serve her up on a silver platter. Hurricanes and Heroes (a Danger Cove Cocktail Mystery) and much more! Family is not always best. Reunions are not always welcome. Twists and turns are many. This story is good. The writing is a little heavy on inner chat and redundant explanation. People could just cry instead of their eyes leaking water. There is a lot of overly cute discussion. But the plot is solid. This narrator was truly incredible. The storyline was so easy to follow as she read it. This was an excellent cozy mystery with a fascinating plot-line. Five star read!